These are the words of Jim Sanborn, designer of the puzzling Kryptos sculpture that sits in the Courtyard plaza of the Central Intelligence Agency in Langley, VA. Sanborn designed this piece of artwork in 1989; it was dedicated at the C.I.A. building in November of 1990. 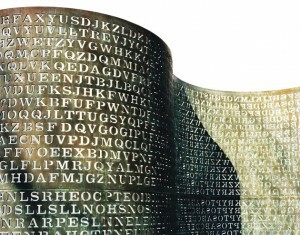 There are four sections to the sculpture, each containing an encrypted message. Three of the four coded messages have been cracked. The fourth one has yet to be deciphered, and is considered one of the most famous unsolved codes in the world. Among these famous unsolved codes are the Beale ciphers, which have remained uncracked since 1885; the Shugborough inscription, carved on an 18th-century Shepherd’s Monument in Staffordshire, England; and the infamous cryptograms from the Zodiac Killer of the 1960s. Kryptos’ first three coded messages were cracked in 1999 by a computer scientist from southern California named James Gillogly. In 2005, Ms. Monet Friedrich, a computer engineer from Vancouver, British Columbia, discovered an error in earlier deciphers that was confirmed by Sanborn. The characters that are the 64th through 69th in the final series on the sculpture read NYPVTT. When deciphered, they read BERLIN. Sanborn was given assistance in the art and science of cryptology by Edward Scheidt, a retiring C.I.A. cryptographer, in order to design Kryptos. To this day, it has baffled the brightest minds and the most sophisticated computers. There is a Yahoo group dedicated to solving the puzzle in a collaborative environment. It was mentioned in the novel “The Da Vinci Code”, and also in the novel “The Lost Symbol”, both written by Dan Brown. Sanborn even has a site dedicated to receive inquiries and potential solutions to the puzzle. This is one heck of a code to crack. We’ll be returning to doing SourceCon challenges after the conference in New York City. In the meantime, why not give solving Kryptos a shot? We seriously can’t think of anything more challenging than cracking K4 of Kryptos. This message has been worked on for twenty years. And its creator wants it solved. Just in case anyone dares to take this on, we offer to you the most Ultimate Prize we can think to offer from SourceCon: a lifetime pass to attend all SourceCon events. We challenge you to take on Kryptos – join deciphering groups, visit the sculpture yourself, learn from the work of others who’ve tried and failed to crack the code. Are you willing to give it a shot? It might be fun! We really don’t expect it to be solved – after all, it’s been around for twenty years and no one’s cracked it yet. But we know you love a good challenge. And if you do solve it, you get to come to SourceCon forever. So go on – we dare you.